From a distance this mushroom looks like a cap-less orange polypore, or a crust fungus like Stereum complicatum--but close inspection reveals a surface of tightly packed, tiny spines, making Steccherinum ochraceum a toothed mushroom. 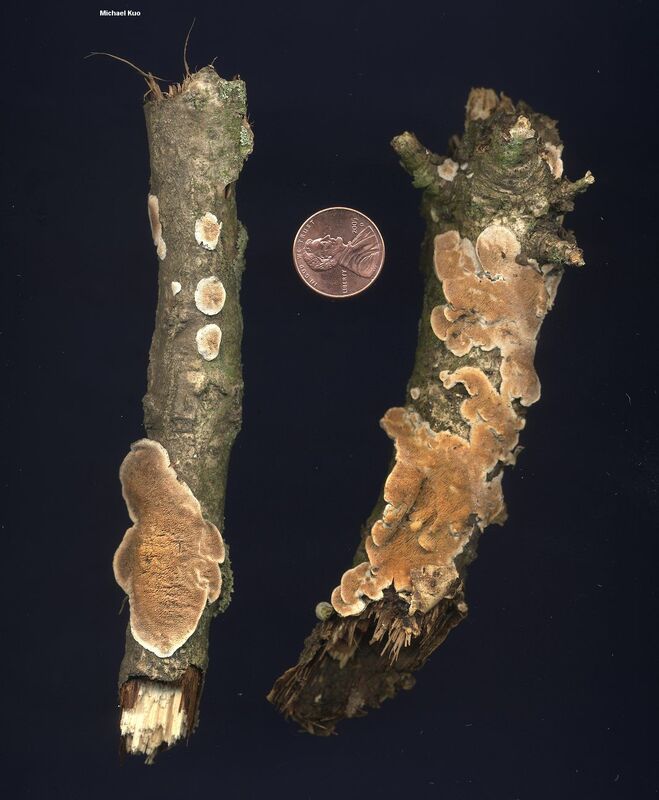 It is a widely distributed decomposer of the deadwood of hardwoods. In the Midwest it is fairly common in oak woods on fallen sticks and small logs in late spring and early summer. 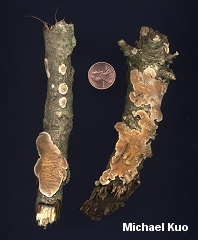 Ecology: Saprobic on the deadwood of hardwoods and, rarely, conifers; growing alone or gregariously on sticks, logs, or stumps; causing a white rot; late spring through fall (or over winter in warmer climates); widely distributed in North America, but more common east of the Rocky Mountains. Fruiting Body: Variable; usually a patch of densely packed spines up to about 3 cm across, with folded-over edges (especially when growing on logs and sticks)--but sometimes with a well defined cap and even, at times, a stem (especially when growing on stumps). Upper Surface: When present grooved and hairy to velvety; with more or less concentric zones of color and texture; grayish to brownish or whitish; margin white, scalloped. 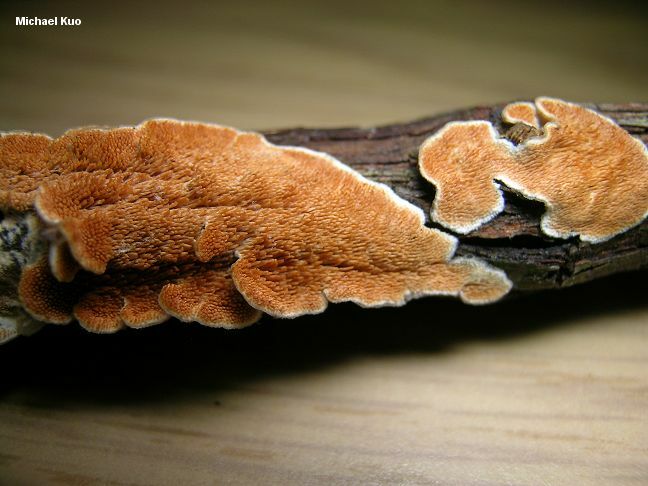 Undersurface: Composed of densely packed spines up to 3 mm long; orange, fading to yellowish or brownish when old; drying to dull salmon in herbarium specimens. Stem: When present up to 8 mm long and 2 mm wide; colored like the upper surface. Spore Print: Undocumented, but probably white. Microscopic Features: Spores 3.5-5 x 2-2.5 µ; smooth; ellipsoid; inamyloid; hyaline in KOH. 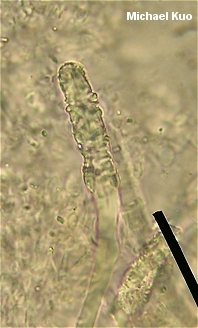 Skeletocystidia cylindric to subfusiform; 4-10 µ wide; arising from the spine trama and usually projecting beyond the basidia; thick-walled; usually substantially encrusted. Context dimitic. REFERENCES: (Persoon, 1792) Gray, 1821. (Fries, 1821; Saccardo, 1888; Maas-Geesteranus, 1974; Breitenbach & Kränzlin, 1986; Lincoff, 1992; Barron, 1999; McNeil, 2006; Binion et al., 2008.) Herb. Kuo 04290604, 04270710.